Leadership Analysis: The Bridge On The River Kwai | Business Article | MBA Skool-Study.Learn.Share. The place: Japanese prisoner-of-war camp in Burma. 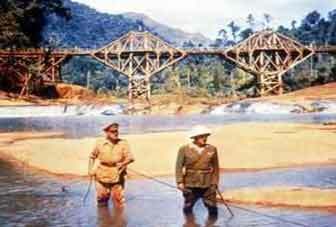 In the setting of World War II, a defeated unit British Soldiers is marched into a Japanese prison camp in western Thailand, with the purpose of constructing a bridge over the River Kwai to carry a new railway line to invade Burma. The camp is run by a dutiful commandant Colonel Saito and his men. The British troop is led by a stiff-lipped Colonel Nicholson. Nicholson is highly revered by his men, he is their friend and confidant; he can do them no wrong. So begins the classic World War II movie The Bridge on the River Kwai. In the August of 2009 during a humid Sunday afternoon we happened to stumble upon this English classic. I presumed it to be just another vintage war movie. However, on careful inspection, it became an excellent treatise for understanding various forms of "leadership" paradigms, which are not only useful in the Army but can be easily observed in contemporary corporate world. It is one of those few war movies which focus more on building its characters rather than the war itself. It portrays two very different leadership styles, which are intensely portrayed by its characters Colonel Nicholson and Colonel Saito. The movie starts with difference of opinion and clashes of ego between the two leads. Saito is persistent that all men should work irrespective of cadre, while Nicholson being a strict disciplinarian insists that he and his officers are not supposed to engage in manual labor. Colonel Saito, exhibits a directive style of leadership, commanding and leading from the front, forcing English officers to work beside their men, taking the control in his own hands when his Engineer fails to deliver results. On the other hand Colonel Nicholson acts as an indirect influencer by refusing to succumb to the demands of the Japanese. To the naked eye his refusal to work alongside his man may seem ridiculous, but his not giving in serves as an inspiration to his men. In the following paragraphs we have tried to further analyze the lead character of Colonel Nicholson from leadership perspective and its result for the individual and FOR THE ORGANIZATION. According to us one of the most important lessons that can be learnt from this movie is “When execution takes priority over strategy, the results can't help being catastrophic”. A leader is never a loud or a boastful person, most of the times he is calm and a swift talker. A Leader is able to cope with myriad of pressures and has the strength and courage to take decisions and to guide his team out of crisis situations, he has the ability to influence and motivate his people to deliver their best even in troubled times. A leader needs to play the role of a negotiator, a strategist, a manager, and an executioner. He always tries to keep away his temptations and to maintain equilibrium between the role plays. As ‘Bent Flyvbjerg’ pointed out in ‘Making Social Science Matter’, a leader should not hesitate to ask questions to his team and to him “Where are we going?” “Who gains, who loses, and by which mechanisms of power?” “Is this development desirable?” “What should we do about it?”. Throughout the movie Colonel Nicholson presents himself as a controlled (Except for the last part where he jumps on the dynamite to save the bridge, his pride), organized and result oriented leader. He utilized, to perfection, The Head and The Hand co-ordination, Head being the intellectual part while hand being the experience amassed through years of maintaining British Empire. He showed the exemplary qualities of a leader by focusing on the people, by inspiring them, influencing them, by motivating them, by setting the direction and creating a vision for his team. He and his team were able to complete the insurmountable task of building the bridge in scheduled time. But his overbearing pride made him oblivious to the end result and throughout the course he forgot to ask himself the most important question ‘Was all that for his own personal sense of achievement or for the better good of the society to which he is abided by the law’. By successfully building the bridge, on one hand he uplifted the mood of his men from the feeling of being prisoners but on the other hand he strengthened the supply chain of the enemy and thus developed a catastrophic outcome from the strategy point of view. If we refer to historical notes and apply the theory of wisdom by classic Greek philosopher, Aristotle, to the Colonel Nicholson’s character then we would experience some interesting insights. Theory of wisdom is broadly classified in two theories, Theoretical wisdom and Practical wisdom. A leader should possess both the theoretical wisdom as well as the practical wisdom. Theoretical wisdom (Greek: Sophia), as explained by Aristotle deals with the scientific know how of things. It deals with the knowledge part of an individual and plays an extremely important role in the success of a leader. Colonel Nicholson, with all his experience and rank under his belt was foremost in his knowledge and the results also showed that no one can question his ability to drive a project of such a magnitude under tremendous pressure and drastic circumstances. Yet one may ask whether the goal that was achieved was Just? Can the leadership of Colonel Nicholson be categorized as Wise? One can have clear answers to these questions if one is aware about the Explicit and Tacit knowledge, terms coined by Prof. Takeuchi. Sometimes leaders try to rely on explicit knowledge as it is both measurable and quantifiable. The problem with this approach is that such leaders are not free to accept change. It assumes a world independent of context and seeks answers that are universal and predictive. However every situation is context dependent, and analyzing them is meaningless unless you consider people’s goals, values, and interests along with the power relationships among them. This is where the Practical Wisdom of Aristotle comes in place. Practical wisdom (Greek: Phronesis), as explained by Aristotle is ‘a true and reasoned state of capacity to act with regard to the things that are good or bad for man’. Although Practical wisdom depends on Theoretical wisdom to work as one should have sufficient knowledge of good and bad, it also adds the capacity to act on such knowledge. Colonel Nicholson was strong on Theoretical wisdom but was he equally competitive on Practical wisdom? Was his strategy correct when it came to building the bridge for the enemy? Was his reason prejudiced and governed by pride? Practical wisdom enables us to make a choice in a particular situation. It calls not only to understand the situation but also to act well in it. Practical wisdom focuses on three main insights, first, understanding to judge good from bad, second, capacity to act in a particular situation, third, the indulgence of virtue, the quality of doing what is right and avoiding what is wrong. As you can’t tell whether the kettle is hot or cold without touching it, similarly Practical wisdom can’t be taught but can only be learnt through various experiences in life. The practical knowledge of what is the right time, objects, people, motive, and way for certain emotions or choices, is the start of the journey to be a successful leader. Can we draw some similarity to 4Ps of marketing here? Let's wait for the next epilogue. This article has been authored by Vatsala Kapur from SCMHRD Pune, India and Shekhar Gahlot from ICS Hitotsubashi , Tokyo, Japan.